It’s Day 5 of Preview Week for Create with Connie and Mary Card “Create”tions Celebrations and WE START on SUNDAY!! So NOW is a GREAT time to subscribe so can get DAILY card inspiration! 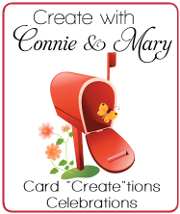 Check out Create with Connie and Mary today! We have such a cool sketch for you this week. What I love about it is how simple it is yet there are so many different things you can do with it. Although…if you check out Connie’s card we were definitely on the SAME wavelength! Whisper White – 3 1/2 x 4 3/4, round bottom left corner. Stamp balloon and string in Pumpkin Pie, Real Red, and Pacific Point (yep…these are my happy colors!). Stamp HAPPY and birthday (multiple times) using Memento Black. Layer piece on Basic Black – 3 5/8 x 4 7/8, round bottom left corner. This entry was posted in Clean and Simple (CAS), Create with Connie and Mary, Spring Mini and tagged Celebrate Today. Bookmark the permalink. I love this card, but what kind of paper did you stamp the balloons on? Great how you and Connie obviously were thinking alike, yet you gave two different, fun interpretations of the sketch. I love the way you stamped the balloons over each other – a great effect! This balloon set is the most fun! I love the way your balloons mingle together and share their colors! The rhinestones are a great touch too! were the balloons stamped on velum? Oh? Then how did you achieve the balloons looking like they were overlapping the other colors? 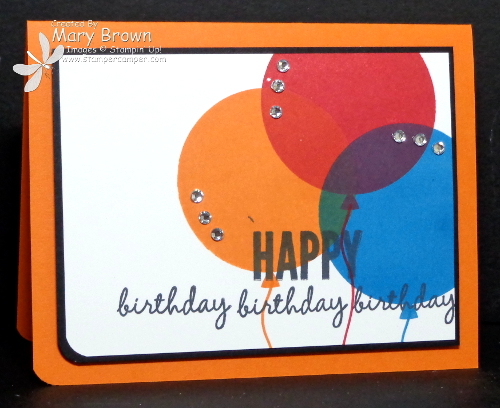 Your balloons are just awesome – great colors and stamping! This is such a bright and fun birthday card. Great use of the sketch! Love the way the overlapping balloons look… just like real transparent balloons look all tied together! Such a simple, colorful and happy card!